Join the fun of Art Journaling! Are you just getting started? Don't know where to begin with all the choices? Let's take a look at them and you'll be sifting through the options in no time at all. You might even save yourself some money! Just click the Play button in the video below. Decide why you want a journal - for art? sketching? to record daily happenings? Which Size Suits You Best? 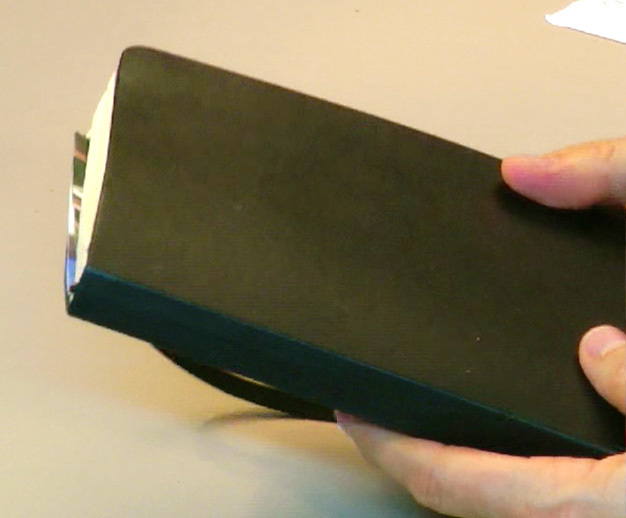 Do you like small or large books? You can definitely have more than one. Perforated or not? Thick or thin? Which journal paper warps? You can spend a couple of dollars or you can spend a lot on a handmade leather journal. How do you decide? How to choose the Best Paper? Paper varies a lot! Mixed-media paper, sketch paper, drawing or watercolor paper. . . So many choices! Check out junk stores for great books to repurpose into art journals or make your own journal from watercolor paper or junk mail. You can't have too many art journals! 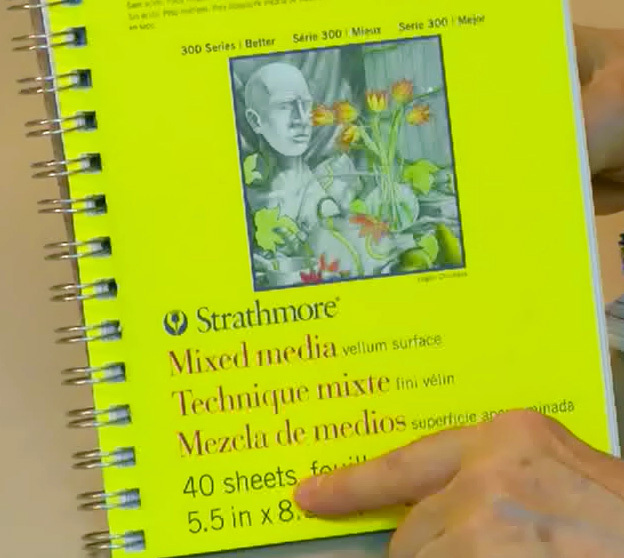 The paper in the Strathmore Visual Journal will take lots of layers of arty goodness. Buy yours here. You can't have too many art journals! 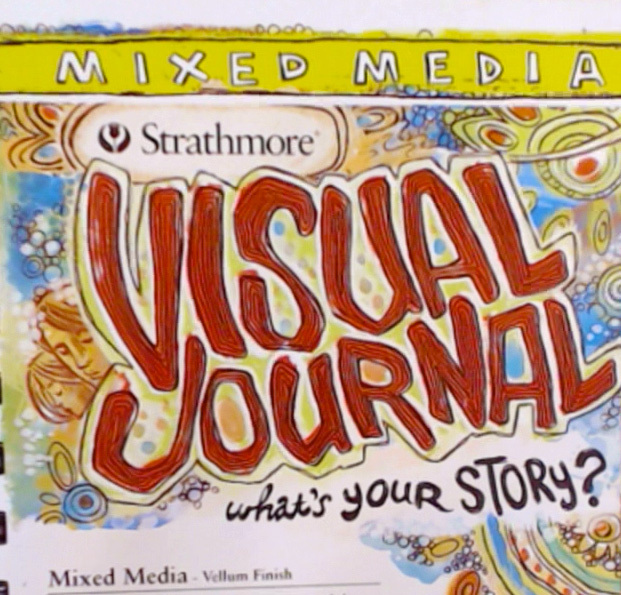 The paper in the Strathmore Visual Journal will take lots of layers of arty goodness. I love having both large and small sizes. Buy yours here. 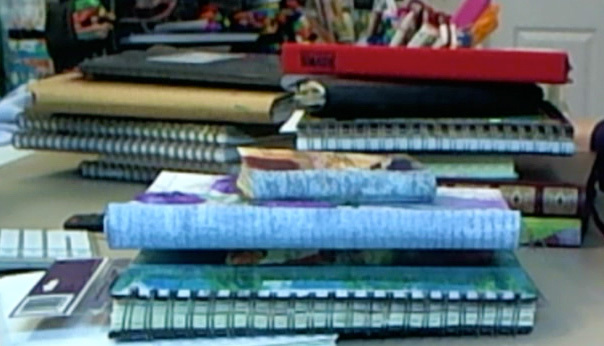 Strathmore makes lots of journals. The 300 series is really nice. Get one here. I like to coat this paper with gesso to change the texture. You can buy yours here. There are loads of Moleskine journals. To use as an art journal, I like this one best. You can buy it here. There's nothing quite like the Dylusions journal! You can buy the small one here. I've enjoyed using the Dylusions journal so much. You can get the large one here. These are inexpensive and make great art journals. Buy Composition Notebooks here. You can never have too many glue sticks! Use them to stick composition notebook pages together. Buy glue sticks here. Gesso is the best thing for prepping journal pages. Buy gesso here. Use a squeegee to help smooth out wrinkles. Buy a squeegee here. If you like a journal with already-decorated pages to give you a head start, a Smash book is great. Get a Smash book kit here. Sketchbook paper is usually light weight. Add gesso to pages for art journaling. Get a sketchbook here. If you like to make your own journals, this is a good choice for the pages. Buy cold press paper here. This paper is smoother and heavier than the cold press paper above. Get hot press paper here. I write in a purchased blank book every night. You can get one here. Did you ever accidentally or on purpose draw in the margins of your textbooks? That never went over very well with my teachers and they sure didn’t call it Art Journaling! Did you know Leonardo da Vinci (1452-1519) carried a visual Journal with him at all times so he could record ideas, impressions, and observations as they occurred? In his Journals Leonardo kept quotes from people he admired, plans for inventions, pages about anatomy, botany, and geology along with his own drawings and paintings. Today we still have access to 7,000 pages of his Journals!! That tells you how important keeping a Journal was for Leonardo! You can learn a lot from someone by looking through their Art Journals - life lessons, art principles, interests and words that the journaler finds poignant. Artists have always kept sketchbooks and Art Journals. Within the past few years Art Journaling has become widely accepted as one of the perfect places for play and self-expression without judgment. It’s also a fantastic way to leave a legacy. Reading my mom’s Journals is a treasure that I wouldn’t trade for anything. She didn’t include art within her Journals, but she left her thoughts, observations, bits of wisdom and things she was grateful for - all in her beautiful handwriting. Her handwriting, with its perfectly formed letters, is an art form all of its own. When Art Journaling became popular, companies began manufacturing Art Journals of all shapes, sizes and paper types by the dozen. When perusing an art or hobby store, you’ll find shelves lined with ready-made books and Journals as well as aisles filled with supplies to create your own books. When you’re looking at all the choices and trying to select the perfect Journal, think about what you like to do. Do you want to use your Journal for writing with some added pencil or pen and ink sketches? Or, do you prefer wet media like watercolor or acrylic paint or markers? Or, do you want a Journal that can stand up to gluing ephemera and collage goodies? Choosing the perfect Art Journal can be overwhelming, for sure, but I’ll help you eliminate confusion so you can go right to the fun part - coloring in the margins and on the pages and on the cover, too. Can you keep a secret? 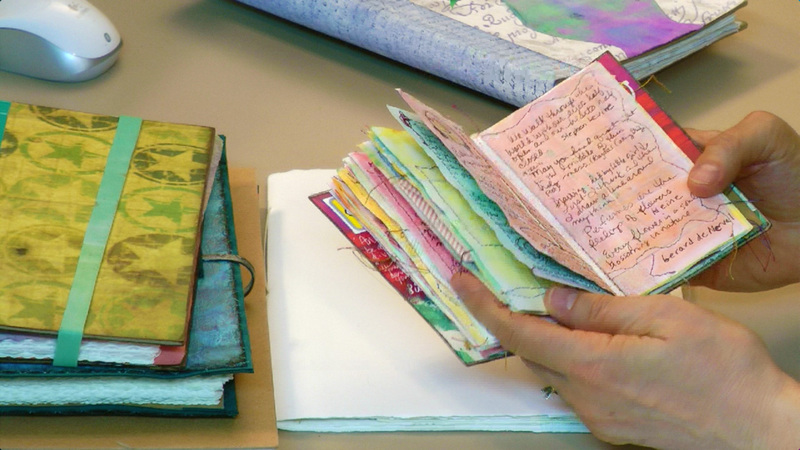 When this class is over you might find more than one perfect Art Journal. You might even need more than two! Let’s get creative and pick the perfect Art Journal (or two or three). Just click the Play button in the video and let's get started. Downlo﻿ad Illustr﻿ated Tutorial Class Notes for this video. Download Text Only Class Notes for this video. All about art journals – so many to choose from! Lets find the perfect journal for you and your style of creativity and fun.